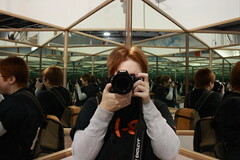 Just me…in a walk-in kaleidoscope…being a photography dork. Neat effect with the mirrors, I must say. I already posted this, I think. Oh, well, REPOST!!! It feels like a vice is screwing down on my forehead. Previous PostBollywoodNext PostSave Our Historical Sites!